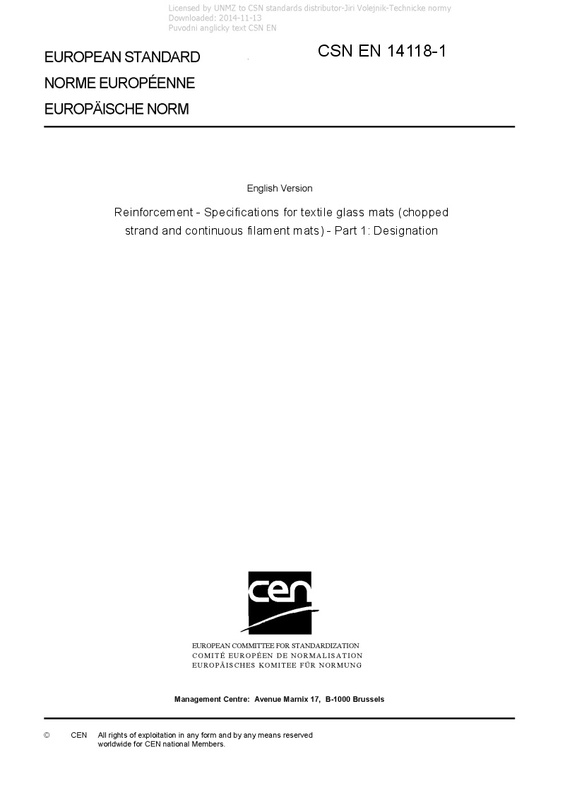 EN 14118-1 Reinforcement - Specifications for textile glass mats (chopped strand and continuous filament mats) - Part 1: Designation - 1.1 This part 1 of EN 14118 establishes a method of designation for chopped strand and continuous filament mats made from textile glass strands, which may be used as the basis for specifications. 1.2 This designation system is for chopped strand an continuous filament mats used for the reinforcement of plastics and hydraulic matrices. It does not apply to mats made from staple fibres, nor to mechanical or stitched bonded materials and to veils. 1.3 It is not intended to imply that mats having the same designation give necessarily the same performance. Nor is the designation system intended to cover all the characteristics of mats. This part 1 of EN 14118 does not give engineering data, performance data or data which may be required to specify chopped strand and continuous filament mats for a particular application or method of processing. If such additional properties are required they shall be determined in accordance with the test methods specified in EN 14118-2.